SmartyPig is an online savings account that allows you to create multiple "piggy banks," each earmarked for a specific savings goal. For example, you can have one "piggy bank" labeled "Buying a Car," one labeled "Trip to Jamaica," and one labeled "Buying a Refrigerator." Having separate "piggy banks" helps you visualize your progress toward each particular goal. This can motivate you more than pooling all your savings into one account. Most personal finance experts refer to the practice of setting up "piggy banks" as creating "sub-savings accounts." Multiple savings accounts are an effective budgeting tool. Once you set up your account (details below), you'll be asked to create savings goals. You can create as many goals as you want. Each goal gets its name. Once you input these three variables (the name of the goal, the deadline, and the amount), SmartyPig will prompt you to decide how often you want to contribute to this goal. You can set up a "funding frequency" that takes place monthly, twice-monthly, every 14 days, or none (which means you'll manually contribute rather than automating your contribution). You can also select what day of the month you want to contribute. If family and friends might want to contribute to your goal, you can set up your account to "accept contributions" from outsiders. When you log in to your SmartyPig account, you'll see the progress you're making toward each goal. You can choose to see this in the form of a percentage or a dollar amount. You can edit your goals, of course. Your funds are held in an account in your name at BBVA Compass Bank, which means your savings account is FDIC-insured. SmartyPig also offers you the option to redeem your money in the form of discounted gift cards. For example, if you set a goal of saving $500 for holiday gifts, you can either "cash out" the goal (withdraw cash), just as you would from a normal online savings account, or you can redeem the money in the form of a gift card in which you get a small bonus amount. If you opted to take a Target gift card for $500, rather than cash, for example, you might get a $525 gift card (a 5 percent bonus). There are plenty of websites, such as Cardpool.com or cardcash.com, that allows you to buy discounted gift cards. Shop around; you might find a better deal on those sites. SmartyPig also offers its in-house credit card with 1 percent cash back. Again, shop around. One percent is a decent cash back figure for a credit card, but you might (or might not) be able to qualify for a card with better rewards, depending on your credit score. 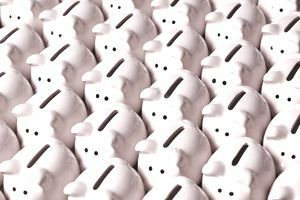 The biggest benefit of SmartyPig, in our opinion, is its core service: allowing you to create multiple "piggy banks" in which you can visually track your progress toward multiple savings goals. Set up is simple — just apply online for an account. You'll need your name, address, and other basic identifying information. You'll also need the routing and account number of at least another bank account, which will link to your SmartyPig account. During the setup process, you'll need to give your bank information to SmartyPig. You'll also have to wait 3 to 4 business days while SmartyPig verifies your account. Once your bank account is verified, you can automatically or manually transfer money from your account to your SmartyPig.